Courtship display: Male perches in very upright position with wings spread and head turned to one side, whilst bobbing his whole body up and down. 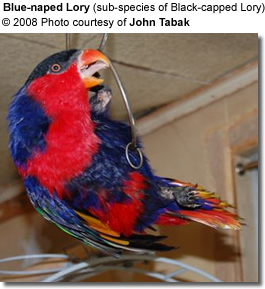 The Black-capped Lory (Lorius lory lory) is endemic to Waigeu, Batanta, Western Papuan Island of Misool (Maluku province), Vogelkop, Western New Guinea. 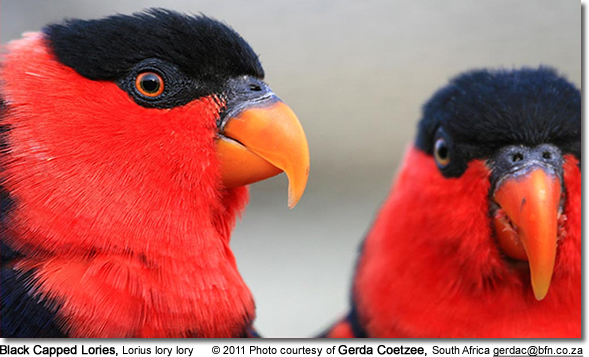 The Black Capped Lory is a medium sized stocky bird with a short, slightly rounded tail. In the wild they are seen in small groups of up to ten but most frequently live as single pairs. In their native habitat, the have an excellent food supply from dense rainforest. These birds typically form very strong bonds with their owners, a characteristic consistent with their wild habits of bonding only to one or two other birds. They make excellent talkers and excellent pets. 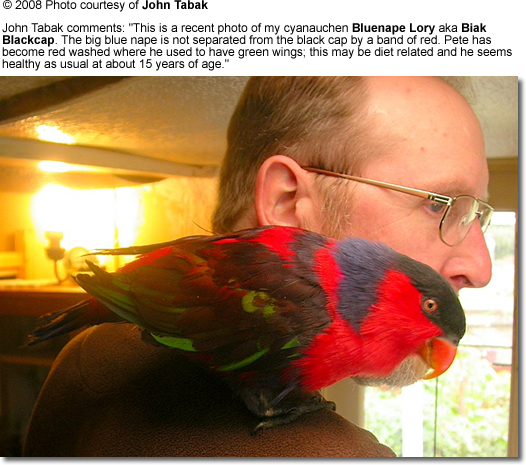 Some of the rarer sub-species should be kept as breeders rather than pets. They can be noisy but infrequently. Fairly hard to find and in much demand because of their pet quality. The Avianweb strives to maintain accurate and up-to-date information; however, mistakes do happen. If you would like to correct or update any of the information, please contact us or alert us below in the comment section. THANK YOU!